We are offering a wide range of Cantilever Air Shafts. Cantilever Air Shaft offered to come in precision designed construction finish and can be made available in different specifications to match up with specific process needs and machine configuration as required by the customers. Further, these provide for lasting usage and are made available at competitive prices. 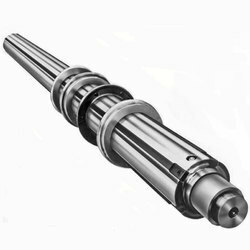 Our organization instrumental in providing superior quality Cantilever Air Expanding Shafts to our valuable customers. Manufactured by using high grade material, these Cantilever Air Expanding Shafts are widely appreciated by our clients. Known for its best quality, we offer these Cantilever Air Expanding Shafts at most reasonable prices to our precious customers. K M Trivedi Engineering Pvt. Ltd.
We are offering a wide range of Air Shaft Cantilever. These are specially designed within the specifications set by the authorities. These are everlasting Cantilever Air Shaft which are available in best price range. - Extra heavy duty rotating assembly. - Impeller adjustment from above baseplate. - Cantilever Shaft are widely used for Pouching Machines, Doctoring Machines & Label Printing Machines. - Cantilever Shaft has a durable construction to hold the cores for the positive gripping. - Cantilever Shaft are in flange mounting styles and are used for light to medium duty works. 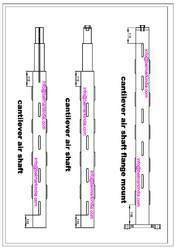 - Mona Cantilever Shaft are widely used for pouching machine, Doctoring Machine & Label Printing machine. - Mona Cantilever Shaft provides superior performance for winding and unwinding process in converting industries. - Mona Cantilever Shaft has durable construction to hold the cores for the positive gripping.